Start Early. Begin planning your move a few months in advance if possible. Get actual moving boxes. You could spend a fortune on boxes and moving supplies, but not necessarily. There are always families that have just moved selling or giving away their used moving boxes in classified ads in papers and online. Good, strong, standard sized moving boxes will protect your belongings better and save time and money on your move every time. It is very time consuming and difficult to load a truck with boxes of all different shapes and incredibly difficult to protect your things if they are packed in boxes with no top or that are falling apart. Pack a little each day. Packing is overwhelming if you try to do it all at once. Start a few weeks before the move by packing a few boxes every day. Start with items that you don’t use all the time like camping gear, fine china, craft and art supplies, etc. Stage your boxes. Stack your boxes in a garage or extra room as you pack them. This will keep them out of the general living space while you are preparing to move. It also saves time and money on move day if all the boxes are in one place in organized stacks. If you are hiring a mover get an in-home estimate. Every move and every home is different. If, for example, your refrigerator doors must come off for it to fit out the door, that will affect the time spent on the move. A professional moving estimator can go over all the details specific to your move and help you plan and budget. You can request a free estimate from the Moving Crew right now. Make a Last/First box on move day. This will be the last and first things you need in your previous and new home. Include things like enough dishes and silverware for at least one meal, medicines, toiletries, phone chargers, important papers, etc. You should always take these items with you personally in your vehicle. Stage your entire home on move day. Pack bedding and break down beds, disconnect appliances, have all the boxes in one place, take mirrors off dressers and keep track of the parts/screws, disconnect and pack all of your audio-video components. 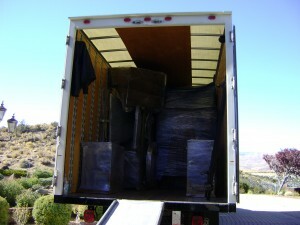 Having everything ready to be loaded saves tons of time on the actual moving process. If you hire a mover this means huge savings on your moving costs. If you are having friends help you move, they will thank you for being super prepared! Moving is something that not too many people love to do, but that everyone must do at some point. Many of us have moved several times and had a range of experiences from chaotic to flawless. Our goal is to work with you and your family to ensure that we all contribute to make the move smooth, safe, and even enjoyable. As professional movers, our staff is very good at moving heavy things in interesting spaces with caution. We cover your furnishings with blankets and wrap them snuggly with stretch-wrap to prevent dents, dings, and damages. We handle all boxes, appliances, furnishings, and belongings with care and safety. Well-packed items secured in a clean, organized truck will prevent damage during transit. Preparing to move your home is a big job, even if you have a small place and not that many belongings. Above all, organization and planning are the key ingredients to a sucessful relocation. We’ve learned from experience that it is good to start packing long before your move date to avoid having too much to do in the last minute. The Moving Crew has great rates for packing and can help you get the right supplies for the job. If you are planning to move we encourage you to have an estimator come to your home or storage unit and view your belongings. The estimator can consult with you on all aspects of moving and help make a plan and a budget for moving and address any issues that may add time to the move like difficult terrain or many flights of stairs. The Moving Crew offers free in-home appointments with no obligation to book. It is always good to ask questions and get as much information as possible, even if you are planning on doing most of the work yourself. Call or email us with any and all questions about moving or to schedule an in-home estimate with an experienced estimator!